Our recent venture into the RPG world of Pendragon indirectly required us to review applicable media that have attempted to re-tell various parts of the Arthurian legends. And thus I spent one of my nights in Singapore re-watching the Hallmark production of Merlin and later on Tobie and I watched this movie together. Now Tobie and I weren't expecting much from King Arthur: Legend of the Sword as the reviews seemed to be significantly negative. But we were curious enough to look into it and try to explore what was unique about this re-telling, and boy did we get a pretty different take on things! This is by no means an effort to accurately portray the classic stories as that's not often the style of movies these days. This was meant to be a flashier, amped up version of things with more complex fight scenes and dizzying special effects. And while we got that, the resulting story was a little confusing and perhaps Arthurian only in name. 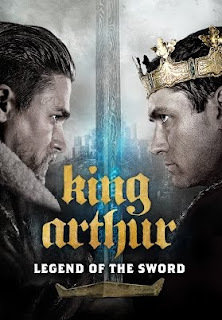 Synopsis: King Arthur: Legend of the Sword is a 2017 fantasy action movie co-written and directed by Guy Ritchie. The screenplay was written together with Joby Harold and Lionel Wigram. The movie begins with a battle between Mordred () the warlock and the forces of Camelot, as led by King Uther Pendragon (Eric Bana). The King manages to infiltrate Mordred's domain and promptly beheads him. But not all is well as Vortigern (Jude Law), Uther's brother, decides to become a demon knight by sacrificing his wife to moat hags. He goes on to kill Uther's wife and later Uther himself. Uther had a son however who manages to survive the events and drifts off to Londinium where he is raised by prostitutes. Fast-forward and we meet the boy, now the young man Arthur (Charlie Hunnam), as he gets by with his wits and his skills at thievery. One thing leads to another and he ends up drawing the famous sword trapped in stone that had appeared near the castle. The sword is of course a magically empowered Excalibur. But he is captured by Vortigern who reveals his heritage and imprisons him, only to be rescued by one of his father's former knights Sir Belvedere (Djimon Hounsou) and the Mage (Àstrid Bergès-Frisbey), an acolyte of Merlin). What I Liked: The movie does have some interesting fight scenes in the very modern style. The opening sequence was definitely attempt to try and establish this movie as an epic fantasy piece by making it look like something out of The Lord of the Rings or something. They certainly have the scale for it and there are a number of interesting sequences that show a certain amount of creativity in trying to map out the sequence. And there was certainly an earnest attempt to really step up the magical side of things by making Mordred super magical and tying in other characters like the moat hags and our mysterious Mage. Sure, getting Merlin might have been more interesting, but what we got was diverse and creative as well. What Could Have Been Better: Sadly, the story as a whole is a tangled mess with weird reasons for this and that. Did Arthur really need to grow up with prostitutes? Did we need him to become a hoodlum with an Asian fighting teacher? Does Jude Law need to be super creepy in any scene he's in? It's hard to explain why things were the way they were. And then you have all the changes to the original myth that didn't really serve any true purpose. The biggest change was the female character of Mage as a proxy for the likes of Merlin or the Lady of the Lake.Why we ended up with her instead of the big players didn't seem all that clear and it's not like she was all that useful. The powers of Excalibur were over-powered to the point of ridiculousness after all with the main effect of demanding a lot of sloppy CGI fight sequences. TL;DR: King Arthur: Legend of the Sword is a strange combination of ancient myth with modern revisionism. I wish the story had still made sense in order to justify the rest of it but it didn't and this was just very odd. And so the movie can only get 1 crazy CGI shadow fight sequence out of a possible 5.